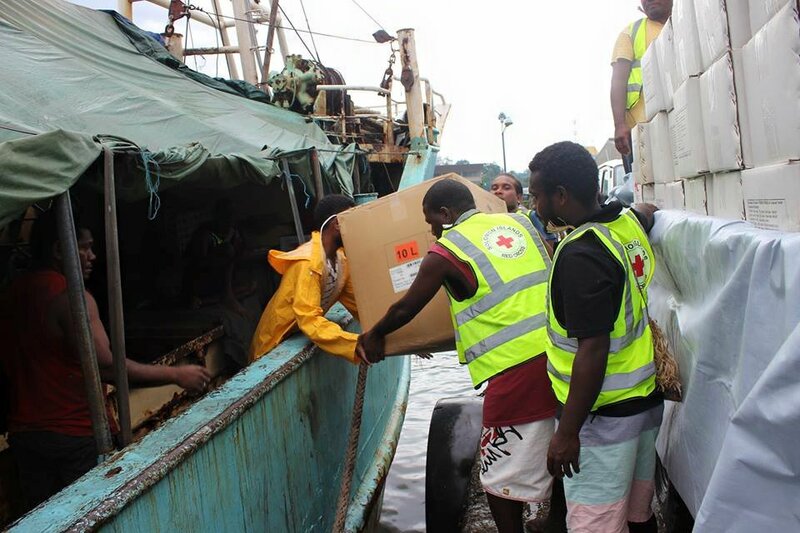 The second batch of relief supplies was sent today (30/12/2016) to Makira Province Solomon Islands accompanied by volunteers following an earth quake of magnitude 8.0 which occurred on 9th December, 62kilometres South -west of Kirakira in Makira Province, Solomon Islands. Solomon Islands Red Cross Society (SIRCS) Secretary General Ms. Joanne Zoleveke said continuation of distribution is happening as part of the current disaster response by SIRCS, and will be done over the coming months,covering affected communities. “It is of utmost importance that we get to reach as many of the affected people within this month and next, as the cyclone season has already started and many of these people are without a proper roof over their heads, let alone living in make shift shelters that will not withstand further natural phenomena, especially heavy rains and strong winds. It is also important that the people affected have some where safe to stay away from where landslides can happen given heavy rains or further strong earth tremors,” Ms. Zoleveke said. The distribution plan for these communities also cover gaps from the initial distribution in affected areas in Makira and will be undertaken as soon as the NFIs are received at the Provincial capital, Kirakira. Volunteers dispatched to the affected areas will be involved in water purification as well as distribution of Non- Food Items (NFI’s) including tarpaulins, kitchen sets, mosquito nets, collapsible water containers, buckets, hygiene kits, blankets and solar lanterns. They will relieve other volunteers in the communities who will be returning after being there for three weeks. According to local reports in Makira Province on average 3 to 4 tremors occur each day and has reduced greatly compared to last week. Provinces and Island hit by the earth quake were Makira, Malaita and Shortland Islands in Western Province. The SIRCS continues to work closely with the National Disaster Management Office throughout this Emergency Response phase at both the national and provincial levels, under the SIG’s National Disaster Management Arrangements.